An appreciation by John Swainston. There have been few individual photographers within Australia who have made such a contribution to the growth and development of the craft of Photography, as David Moore, who died on the evening of the 23rd January after a very private and stoic illness. It was just two days before his major retrospective show The Spread of Time was due to open at the National Gallery of Australia. The legacy of his work will remain for many years to come. He leaves more than a dozen books, more than fifty years of professional work and the institutions which he either co-founded (Australian Centre for Photography, 1974) or worked within (Australian Institute of Professional Photography - AIPP. )David Moore was born in Sydney in 1927. In 1938 at the age of eleven, he was given a Coronet box camera. In one way or another he spent the next 65 years pursuing a journey of craft discovery and documentary record unmatched by any contemporary photographic practitioner. He spent a short period in the Australian Navy at the end of WW2, before starting architectural studies. Perhaps it was the disciplines of precision and exactitude that he learned there that marked out his careful and meticulous approach to his work throughout the rest of his life. Any photographic project with David was always one of making sure that the very best possible outcome resulted, through careful preparation and detailed completion. The strength of his seeing eye produced his exceptional work. After working with Russell Roberts, Moore moved on for a short period working with Max Dupain, bedding down his skills as a commercial photographer. At the same time he was constantly drawn back to the harbour of Sydney, a preoccupation that would continue for more than 50 years. Some of his documentary observations of the wharves and views around Sydney Harbour, Paddington and Redfern and Alexandria, made between 1947 and 1951 are amongst his most known and strongest works. He would return over many decades to the scenes of his earlier documentary work and re-record change. Like a conductor returning later in a career to re-record one of the great classics, David would instill a new insight into the flow of a changed cityscape. He often spoke of the important influence that American photographers Walker Evans and Dorothea Lange had on his formative views of documentary record through photography. At the same time he was an avid collector of photographic books, often hard to obtain in post-war Australia. But as a result he knew that he wanted to tread the path of photojournalism and departed to Europe in 1951.In an interview with Nikon Light Reading in 1989 (Vol.4 No. 1), he was asked how he prepared for an assignment for a photo story. Moore stated: "Inevitably you have preconceived ideas about any subject you approach. But it's important not to let those attitudes and feelings override what the subject is going to say to you... Particularly in photojournalism, you can do your homework on what's going to happen in an event or situation, but you should also be free to let yourself go laterally if things don't follow the exact line that you thought they would. I think that's terribly important." He put this thinking to work in his first Life magazine assignment, the Coronation of Queen Elizabeth II in 1953 in London. His image of the rejoicing crowd, taken from within the body of that crowd, looking up to a waving enthusiast mounted on one of Trafalgar Square's statues, set him up for many more assignments. In 1956 he again used his careful planning to place himself advantageously to make one of the most telling allegorical images of the period. The image is of the departing car of Soviet Foreign Minister Bulganin and Premier Kruschev, with two onlooking boys with toy pistols pointed squarely at the open window of the diplomatic vehicle. How times have changed. After some varied assignments in the USA, Europe and Africa, Moore returned to Australia in 1958. Yet he continued to take assignments for US magazines while based in Sydney and joined the respected New York Black Star photo agency. There was a wonderful reunion of Australian Black Star photographers in 2000 in Sydney, on the occasion of the visit to Australia of John Loengard, the legendary photographer and pictorial editor with Life Magazine in the 50's and 60's. Moore had learned much of his craft skills by observing the likes of Loengard and Eugene Smith at work in one of the last periods when pictorial magazines broke key stories, prior to the dominance of television as the newsbreaking visual story teller. It was always one of Moore's regrets that the television age had resulted in print publishers moving away from strong pictorial documentary work. Perhaps one of Moore's most important and lasting contributions to Australian photography was the work he did in the early seventies, working with Wes Stacey and others, that resulted in the formation in 1974 of The Australian Centre for Photography, based in Paddington, Sydney. In his submission to the Director of the Visual Arts Board of the Australia Council in 1973 he proposed the establishment of a foundation with the following objects: The foundation for Photographic Expression: A means of collecting, exhibiting, preserving and encouraging meaningful still photography, primarily from Australian sources. An establishment for the photographic medium, aligning it with the fine arts in helping Australians towards self-definition and development. In 1974 The Australian Centre for Photography was opened by Margaret Whitlam. It was fitting that it was David Moore himself who filled in for Margaret Whitlam on the occasion of the opening of the 25th Anniversary show at the ACP. It was an institution in which he retained an abiding and deep seated passion. Just a few weeks ago, in a joyous get together last November, he said to a group of us, "I think the ACP is going in the right direction and will be all right." In 2002 it taught over 1100 students and ran 9 international standard exhibitions. Moore was a prolific published photographer, but he also felt very deeply that Australia as a young nation had an almost unparalleled photographic record of its history. Together with Rodney Hall, he set about compiling, in words and pictures, a project that became AUSTRALIA - Image of a Nation, published by William Collins in 1983. In concluding his preface he wrote: "This volume seeks to acknowledge and celebrate the finest photography of the past. Additionally it may provide a framework of understanding for the identity of Australia's future generations." His work continued and his status as a 'collectable photographer" grew in the seventies and eighties. His two volume book - David Moore - Australian Photographer,. (publ. Chapter and Verse 1988,) established Moore as a broad-ranged photographer, exposing many to his more abstract work for the first time. The flow of Sydney Harbour ebbed through these volumes and was further explored in his 1993 Publication, also with text by Rodney Hall, simply entitled Sydney Harbour. It coincided with an impeccably curated show at the State Library by Alan Davies, to coincide with the book launch, involving an immersive 360 degree panorama of sunrise in the harbour shot in 1992, which appears as separate plates in the book. Again his preoccupation with documentary record of the city of Sydney took him to the railway workshops in Everleigh, in a joint collaboration with the recently departed and much missed Caroline Simpson. Like Caroline, Moore was determined that visual records should be made of the changing face of his home town. Moore was always concerned that photography could play a vital role in providing evidence and record. He used his attention to detail to ensure that the record was an enduring one. 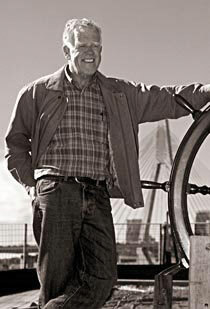 In the same way, when the Glebe Island Bridge was constructed, he used his long-term commercial contract history with Baulderstone, the builder of the bridge, to document the entire construction, culminating in the outstanding book To Build a Bridge, published again by Chapter and Verse, in 1996. In an interview with writer and broadcaster Margaret Throsby, for the Book Sydney People and Places, with photography by Graham McCarter in 1991, Moore stated about Sydney; " Sydney is a dramatic visual city, and there's a lot of pushing and shoving going on. Of all the places I have been, and I have been around a bit, I am pretty damned sure I wouldn't want to live in any other city in the world." Despite that, in recent years he set about making a hideaway for himself in Tasmania, doing much of the woodwork and restoration himself. He had built a boat, in a resonance of an earlier construction of a very unsafe canoe in which he had launched out into the middle of Sydney Harbour in the early' 40's.In 1989 he was inducted into an Honorary Fellowship of the Australian Institute of Professional Photography, while in 2002 he was awarded an Honorary Doctorate of Letters by the University of New South Wales. Returning to Sydney from the Uluru AIPP conference at which he received his Honorary Fellowship, four of us found ourselves stranded for a plane on the day before the Airline strike that paralysed transport for several weeks. The journey via Alice Springs and Canberra would eventually take over 12 hours. But the time passed as if in a flash, because David shared with us the beliefs and views he had about photography, while deeply engaging us by teasing out our own opinions. That same year I had the pleasure of working with him on the 1990 Nikon Australian Calendar, a project that produced a wonderful collection of 13 images, immaculately presented. His attention to detail ensured a perfect calendar, which hundreds of Australians treasure till this day. Last week WriteLight Press released the first reprint and update in their series Contemporary Photographers: Australia. It was fitting that publisher, Paul Burrows, had selected David Moore as the first to be published in the series. It goes on sale next week at leading bookstores and galleries. David had been keen to add abstract work of a new dimension, which he had made in 2001, to the earlier published work. The series of six images, Moon Writing - camera in motion, 2001, hark back to another common thread of his life. He returned to earlier ideas always making new impressions on the work of earlier years. On Saturday 25th January, The Spread of Time: The Photography of David Moore opens at the National Gallery of Australia. Senior Curator of Photography Gael Newton has assembled images from the more than 300 images contained within the NGA's collection, many of which were donated by Moore himself. In a few weeks, David Moore would have celebrated his 75th birthday. Nikon and Maxwell were honoured that we were able to support in part this wonderful exhibition which runs from 26th January until May 25th 2003. To the end he was concerned for the rights of all creative artists. I remember well his outrage in the mid 90's, when he discovered that under Australia's Copyright laws, he had outlived his own copyright in his 1947 images of Pyrmont. Of all creative disciplines, photographs alone have a fifty-year copyright following first publication. In all other instances of creative endeavor in Australia, - painting, writing, music, copyright remains for fifty years after death. Perhaps his passing might be a catalyst for change in something which he so strongly believed was morally wrong and discriminatory. David Moore became a friend and counsel to so many of us who shared the joy of discovery that is photography. His passion, his discretion, his private determination, all marked someone one was proud to have known and been fortunate enough to call a friend. His Christmas Cards were all wonderful works of creative thinking, every year a new drawing, etching or design, all with that carefully crafted hand written personal message of good wishes. For 2002 he wrote, in accompaniment to an image of a reindeer, "Soon we will be back in paradise Tassie with the reindeer. Have fun." Wherever you are now David, we know that you'll quickly have the place organised to ensure a proper documentary coverage of all that develops in photography heaven from now on. To David's partner Toni McDowell, and to David's family we extend our sincerest sympathies. David Moore: Australia's first international photographer. This writer expresses thanks to the many writers who have provided detailed written accounts of David's life. In particular I have drawn on Sandra Byron's words in her foreword to David Moore - Australian Photographer, Vol.1,published by Chapter and Verse, 1986. My thanks also to Gael Newton for her constant support and enthusiasm for David's work over many decades. Finally to Josef Lebovic, of Josef Lebovic Gallery, Sydney, who has done so much to establish the merit of David Moore's work worldwide.